Riad Sattouf is a Syrian-French cartoonist whose graphic novel depicts his life growing up in Syria and Libya in the 1980s. His book was a bestseller in France and is now being published in English. An excerpt from The Arab of the Future about growing up in Libya in the 1980s, where housing was free. But another family moved into the author's home while he and his family were away. Author and cartoonist Riad Sattouf. Riad Sattouf is half-Syrian and half-French and grew up in the Middle East in the late 1970s and 1980s. He lives in France now, but tapped into his youth for his graphic novel, The Arab of the Future, that explores life under Arab dictatorships a generation ago. His book is already a best-seller in France and is coming out in English in the U.S. this month. I met the cartoonist at his Paris publisher with a copy of the English edition of his book under my arm. It's his first glimpse of it and he's thrilled. "For me it's a dream to have a book in English," he says, laughing. "I love it!" Sattouf used to draw for the satirical magazine Charlie Hebdo, but left last year, prior to the shooting terror attack this past January that left 12 dead. He has long been captivated with the secret world of young people. Through simple, expressive drawings and droll text, Sattouf tells his story, which begins with his Syrian father finishing up his doctorate in France. Sattouf says his father could've taught anywhere. "But he preferred to go to Libya and work for [strongman Moammar] Gadhafi than go to Oxford," he says. "Because he was obsessed by the education of the Arab world and he wanted to give back the education he received." Sattouf says his father was the only child out of his large family who went to school. Full of enthusiasm and grandiose pan-Arabist visions, Sattouf's father drags the family along with him. Through the son's eyes, the reader gets a rare and captivating glimpse into a corrupt, patriarchal and very strange world. "I wanted to show in my book this fascination I had for my father. The admiration that children often have for their parents," says Sattouf. "I was thinking he was strong and brilliant. And with my grown-up view, I also wanted to show how horrible certain of his views were. And show how I was fascinated by horrible things without realizing they were horrible." The family arrived in Tripoli in 1978, the year Sattouf was born. The country was run according to the whims of Gadhafi and his Little Green Book. At first it appears utopian. Everyone gets a free house. But it doesn't come with a key. When the Sattouf family makes the mistake of taking a short walk just after their arrival, they return to find their luggage outside and another family inside their house. "So my father said, 'Hey it's our house!' and the guys told us, 'No, there is no private property in Libya,' " says Sattouf. " 'You weren't in the house so we have authorization to take it for our family.' "
Sattouf says his family eventually found another empty house. But when Gadhafi ordered everyone to switch jobs, his father had had enough. The family moved to Syria — back to the poor rural village where his father had grown up. The young boy — blonde and not fully Arabic-speaking — must find his way in the rough and tumble world of Syrian peasant children. Through his simple childhood observations, Sattouf paints a larger picture of Syrian society of the day. Playing toy soldiers, he remembers the plastic Syrian combatants were molded into brave and noble poses — while the enemy Jews were cowardly and duplicitous. "And all of my cousins were saying, 'Oh, he's surrendering. But look! No, he's got a knife! Because he will come and when you surrender he will stab you!' " says Sattouf. "This was, you know, to put in the mind of children that you have to stay focused on your enemy forever." 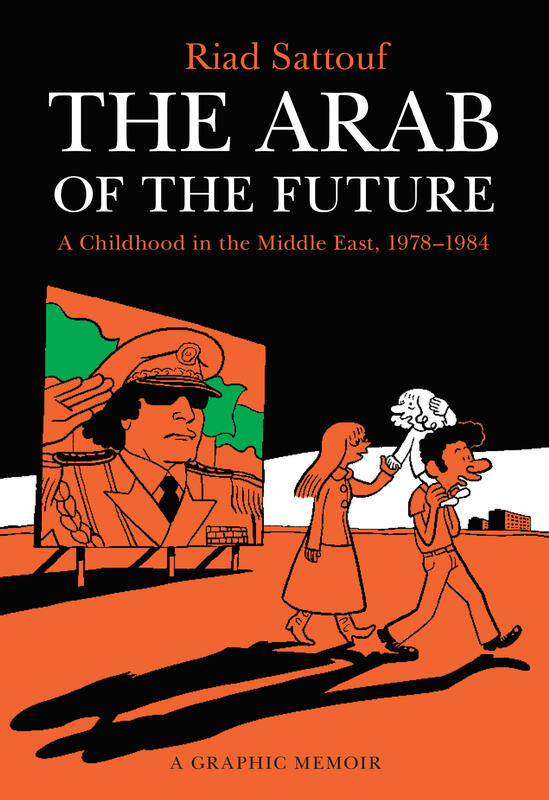 Sattouf says his book is not meant to be a general vision of the whole Arab world at the time. Just his experience in a poor Syrian village. "I prefer the truth of the experience, and that's what I tried to do in this book," says Sattouf. "To bring just one small vision and point of view and let the reader make his own judgment." The story is punctuated with trips back to France to visit his maternal grandparents. Sattouf says Syrian rural life was probably not so different from the life his great grandparents lead in rural Brittany at the beginning of the 20th century. "My great grandmother was also living without water and electricity and taking care of the children while the men had all the power," says Sattouf. "I tell this in the book to show there actually are a lot of common points if you look at it through history." 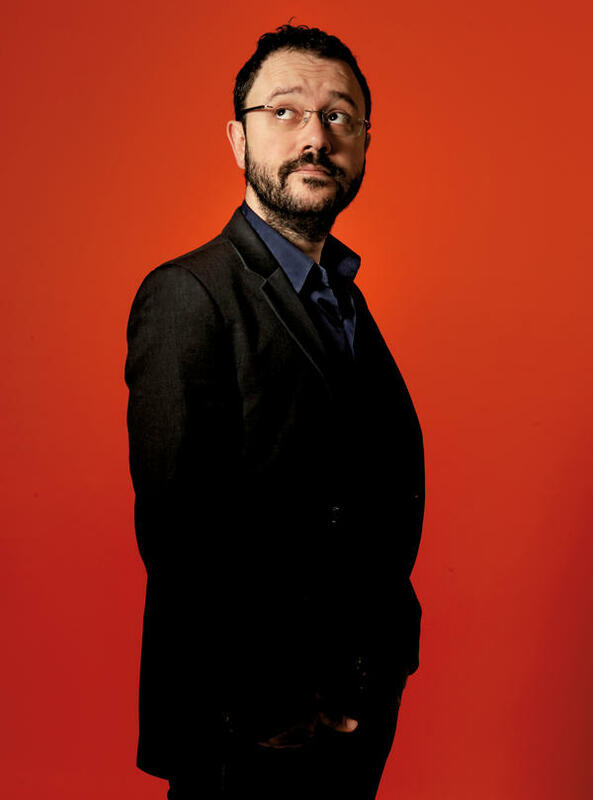 Sattouf says the idea for his memoir arose from his frustration over French bureaucracy when he was trying to bring some of his family members to France in 2011 when the Syrian uprising began. It was then he decided he had to start his tale from the very beginning. I ask the successful French cartoonist if he feels Syrian. "Before feeling French or Syrian, I feel like a cartoonist," says Sattouf. "That's my first nationality." The Arab Spring and it's harsh aftermath have a precedent in the Arab world. Decades ago, intellectuals especially believed Pan-Arabism would bring prosperity and opportunity. The graphic memoir "The Arab Of The Future" is an engrossing and humorous glimpse into the time after that dream died seen through the eyes of a child. The first in a trilogy, the memoir was a best-seller in France and is now out in the U.S. NPR's Eleanor Beardsley recently sat down with cartoonist Riad Sattouf. ELEANOR BEARDSLEY, BYLINE: I meet Sattouf at his Paris publisher with a copy of the English edition of his book under my arm. It's his first glimpse of it. RIAD SATTOUF: I love it. SATTOUF: It's - for me it's a dream to have a book in English. You know, it's - I'm very happy. BEARDSLEY: Sattouf, who used to draw for the satirical magazine Charlie Hebdo, has long been captivated with the secret world of young people. In "The Arab Of The Future," he transports readers back to his own childhood. Through simple expressive drawings and droll text, Sattouf tells his story, that of a half-French, half-Syrian boy growing up in the Middle East of the late '70s and '80s. It begins as his Syrian father finishes up his doctorate in France. Sattouf says his father could have taught anywhere. SATTOUF: He preferred to go to Libya and work for Gadhafi than go to Oxford because he was obsessed by the education of the Arab world. BEARDSLEY: Full of enthusiasm and grandiose Pan-Arabist visions, Sattouf's father drags the family along with him. Through tiny Riad's eyes, the reader gets a rare and captivating glimpse into a corrupt, cruel and very weird world. SATTOUF: And I wanted to show in the book this fascination I had for my father because I was thinking he was strong, and he was brilliant, and he was... And with my grown-up view now, show how horrible certain of his views and thinking were and how I was fascinated by horrible things without realizing they were horrible. BEARDSLEY: When the family arrives in Tripoli in 1978, Libya is run according to the whims of Moammar Gadhafi and his little green book. At first, it appears utopian. Everyone gets a free house but without a key. When the Sattouf family goes on a short walk after arriving, they return to find their luggage outside. SATTOUF: And in our house there was a family who had already took the house. So my father said, hey, it's our house. And the guys told us, no, there is no private property in Libya. You were not in the house. We have the authorization to take empty house for our family. BEARDSLEY: Eventually, Gadhafi's Libya becomes too much to bear, and the family heads to Syria. Little Riad, blonde and not fully Arabic-speaking, must find his way in the rough-and-tumble world of Syrian peasant children. Through Riad's simple childhood observations, Sattouf paints a picture of Syrian society of the day. Playing toy soldiers, he remembers the plastic Syrian combatants were molded into brave and noble poses while the enemy Jews were cowardly and duplicitous. SATTOUF: And all my cousins were saying, oh, he's - he's surrendering, look. No, he's got a knife because you will come, and when you will surrender, he will stab you. It was, you know, to put in the mind of children that you have to stay focused on your enemy until forever. BEARDSLEY: Sattouf says the idea for his memoir arose from his frustration over French bureaucracy while trying to bring Syrian family members to France. But then he decided he had to start his tale from the very beginning. So does the successful French cartoonist feel Syrian? SATTOUF: Before feeling myself French or Syrian, I feel myself like a cartoonist. BEARDSLEY: The second volume of his work will come out in English next fall. And Sattouf says he's currently working on the third volume of his "Arab Of The Future" trilogy. Eleanor Beardsley, NPR News, Paris. Transcript provided by NPR, Copyright NPR.